This is the continuation of a post which begins here, and which has simply broken into two for purposes of manageability. (Click on the chart for a better view). Throughout this post I have spoken continuously about demographically driven labour market tightening in Germany, but what exactly is the current position in this regard? Well let's start by looking at the above chart which comes from the Federal Statistical Office. The first thing to note is that the German population actually peaked in 2003, and has since been declining. The same also goes for the economically active population. The key point to grasp here is that the potential unemployed population now has a natural tendency to decline in Germany, even with zero economic growth. Obviously, and in particular during 2006 and the first quarter of 2007, the German economy has been growing at what is - by German standards - a pretty high rate, so the natural decline is also accompanied by a real decline produced by increased employment. The second thing to note about the table is that these are unadjusted data, so to get a real idea of what is happening you need to compare the same quarter from one year to another. Now if we compare, as an example, data for the first quarter, we can see that between Q1 2005 and Q1 2006, the economically active population dropped by some 425 thousand, while unemployment dropped over the same period by some 440 thousand, so effectively there was a only a small decline in effective unemployment (or, if you like a small rise in employment of 20,000 people), despite the sharp fall in the unemployment rate. Now if we come to Q1 2007, we can see that - when compared with Q1 2006 - the economically active population dropped by some 120,000 people (less than in the previous year, presumably reflecting the fact that with the improved labour market conditions more people proportionately remained economically active) while unemployment dropped by nearly 700,000, showing that there was in fact a real and substantial increase in employment in 2006. The point I want to make here is that while the improvement in employment in Germany in 2006 was real and substantial, with population numbers ticking-on downwards, and hence the economically active population trending down, the "natural unemployment rate" outside of substantial recessions will do so too, regardless of real economic conditions. Which leaves us with the question as to where the labour force will come from to fuel future economic expansions. This becomes doubly important when you take into account - as I explain in this post over on Demography Matters - that migration flows are now more or less neutral, that is, almost as many people leave each year as enter. Presumably Germany will at some point have to change its immigration policy, but it will be interesting to watch and see just how and when. Now since I have asserted repeatedly throughout this post that consumption has long been structurally weak in Germany, it would perhaps be interesting to also flesh this part out a bit more (and in doing so I am going to freely draw on work which Claus Vistesen did for this post here). 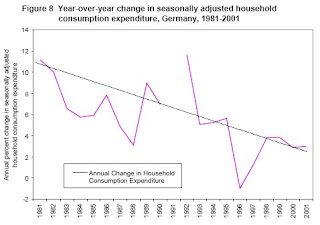 Now as Claus argues, one of the most striking features of the German economy over the last 25 years - with the exception of the post-reunification boom that is - has been the secular decline in the rate of household consumption growth. The above figure comes from a paper by Adam S. Posen (summarized here by Wolfgang Munchau) and shows the evolution of German household consumtion from 1991 to 2001 - with the exception of the early 1990s re-unification years which are left out in the figure. Since the time series used ends in 2001 we also need to look at the data from 2001 to date to try and get a more complete picture. For this I rely on calculations and estimates made by Claus Vistesen. my rough calculations on price adjusted private consumption expenditure figures from 2002 through 2006(Q1-Q3) show an average increase in private consumption in percentage change of previous year of 0.14%. However, if we exclude the first three quarters of 2006, during the years 2002 through 2005 Germany actually recorded a slight average decline in private consumption of -0.68% y-o-y. This should perhaps indicate that the impressive year in 2006 needs to be explained by other factors, like forward purchasing as a result of the VAT hike perhaps? It is also worth bearing in mind here that the OECD private consumption index shows for the same period (02-05) an effective stagnation in private consumption relative to 2000 PPP figures (indeed if we take the readings for 2001 to 2006 inclusive there is precisely 2% growth in real personal consumption over 6 years, or 0.33% growth per year). Another issue which arises in this context is the contribution of of domestic consumer demand to GDP growth. This needs to be looked at from two points of view. In the first place there is the contribution made by domestic consumer demand to real GDP growth, and secondly there is the total share of domestic demand (private consumption) in nominal GDP. In terms of the former the IMF paper referred to above offers interesting and relevant data on Germany's export share in GDP growth. In the first place it is important to note that one more time the reunification boom stands out as something of an irregularity in the general trend. This being said, if we examine the chart below we can see that post re-unification, growth in domestic demand has been making a smaller and smaller contribution to overall GDP growth. As can see from the chart the contribution of demand to real GDP growth has been pretty volatile over the entire time series, but if we factor out the reunification boom domestic demand's contribution to real GDP growth has steadily declined since 1994, and this decline becomes especially noteworthy from 1999 and onwards. In this sense we should be able to see that the emergence of an export driven growth path has become pretty clear. Moreover if we look at calculations provided in the paper from the German national account figures, we find that the total share of private consumption in nominal GDP has fallen to around 60%. In fact Claus's back of the envelope calculations show a 59% share of private consumption in nominal GDP between 2002 and 2006 - a figure which is relatively stable y-o-y; that is to say, the decline is so slight (yet steady) you have to go into decimals in order to track it. This figure is of course in striking contrast to younger societies such as India for example where private consumption accounts for about 70% of GDP but also with economies such as the UK and the US where the consumption share of GDP is much higher than in Germany. 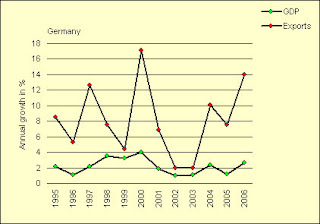 The following chart shows the evolution in German trade from 1995 to 2006. It is extracted from data supplied by the German Federal Statistical Office. The first column shows exports, the second one imports, the third shows the trade balance (exports minus imports), the fourth the % increase in imports from the previous year, and the fifth the % increase in exports. What can be seen from the chart is that the rate of increase in German exports hit a peak in 2000 (coinciding with the internet boom year), crashed and only really started to gather pace again in 2005 and 2006. It should also be noted that in the strong growth years, rates of export growth have been very rapid indeed, hence the 21% growth in 2000, the 9% growth in 2005, and the 16.5% growth in 2006. The interesting question arises, however, as to just how sustainable this growth is in the longer term, in particular given, as we shall see below, the significant impact of exports to the Eastern European countries, and continuing doubts as to just how long the rapid rates of growth being seen there can continue, given the labour supply constraints they are about to face. The following chart shows the principal destinations for German exports (by percentage share), and the evolution of each destination over the 1995 to 2005 period. The above chart is, in fact, really interesting, since, for all the talk in the press about the growth in exports to China and other third world emerging markets (and these of course have been growing very rapidly of late) due to the low base from which such exports start, the real impact on German growth is limited. Exports to the US, other old EU countries AND to the new Eastern Europe Accession countries, on the other hand, are all comparatively important. Exports to the new EU countries in 2005, for example, represented 8.6% of all German exports, which compares with a figure of 11% for ALL Asia. 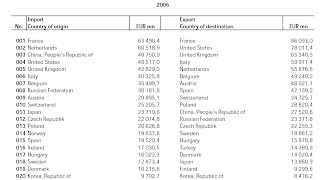 Now if we look at the chart below, which shows the top twenty sources of German imports and destinations for exports in 2006 (in value terms, millions of euros) we can also find some surprises. Like, for example, the fact that exports to the Czech Republic alone were not that far short of exports to China despite the huge difference in the relative sizes of the countries. Exports to Poland were in fact greater than exports to China. So I think this chart really gives us a much clearer perspective on things, and enables us to see just how Germany might be sensitive to a growth slowdown in Eastern Europe. "Investment and lending have boomed in eastern Europe, pushing up wages and spurring consumer spending, as eight nations joined the European Union in 2004 and a further two followed this year. More than 60 percent of new credit to emerging markets went to European countries in the last three months of 2006, the BIS said today in a quarterly report." Now a phenomenon which is accounting for 60% of new emerging market credit seems to me to be a pretty important one, and Eastern Europe as such seems to form a relatively important part of the current momentum in global growth, all of which leads us to ask what the impact on Germany will be when all of this eventually slows. Clearly India and others are now coming, so there will be new opportunities, but will German exports be able to retain their relative hegemony in these new markets? This, I think, is an important question. The graphs below - which show the evolution of GDP growth and balance of payments surplus as a % of GDP over the years between 1990 and 2004 - offer us some more evidence for what export dependence means. While the correlation is far from exact, a certain relation can clearly be observed, with GDP expressing a lagged drop subsequent to declines in the level of the BoP surplus (thanks to Claus Vistesen for this). So someone somewhere should be able to develop a "sensitivity index" from all of this. Reinforcing the above the next graph below shows % changes in both GDP and exports on an annual basis between 1995 and 2006 (thanks again to Claus Vistesen). Again (and with a lag) GDP growth seems to follow movements in the growth in exports. It is also worthy of note how the rapid decline in the rate of export growth following the bust in the internet in 2001 is followed by a protracted period of low GDP growth. I think what both the above graphs clearly suggest is a susceptibility of the German economy to any slowdown in the rate of growth in global trade, and this simple fact alone should help us put some sort of perspective on those claims that the current German recovery may become self sustaining. 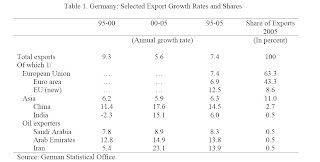 In this post I have examined some of the structural characteristics of the German economy in the light of certain stylised facts about the recent wave of global growth and the apparent structural dependence of elderly economies (median age 41+) on exports for growth. We have been able to see how growth in German GDP is somehow structurally linked to growth in world trade thanks to export dependence, and that in this whole picture the new EU Accession economies play an important strategic role. We have also seen how weaknesses in the volume of human capital entering the German labour market may well have been decisive in determining a high skill component in the outsourcing practices of German firms, with a consequent long term impact on the aggregate levels of German wages and salaries. We have also noted that this latter effect becomes rather preoccupying when it is considered that for a proportionately smaller workforce to support a proportionately larger elderly dependent population what is needed is more (and not less) value added per worker. Overall Development in Foreign Trade 1950 - 2006. German Statistical Office. Order of Rank of Germany's Trading Partners. German Statistical Office. German exports in April 2007: +13.1% on April 2006,German Statistical Office, 8 June, 2007. 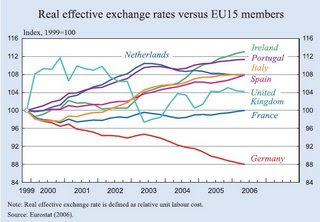 Labour costs in the first quarter of 2007 and in an EU-comparison for 2006, German Statistical Office, 8 June, 2007. Impacts of outsourcing on Germany and Austria's human capital, Alexander Raubold. Phd Thesis. Munich. ‘A Nation of Poets and Thinkers’ - Less So with Eastern Enlargement? Austria and Germany, Delia Marin, University of Munich, Department of Economics, Discussion Paper 2004-06. According to the Federal Statistics Office German sales abroad fell 1.4% in March when compared with February. 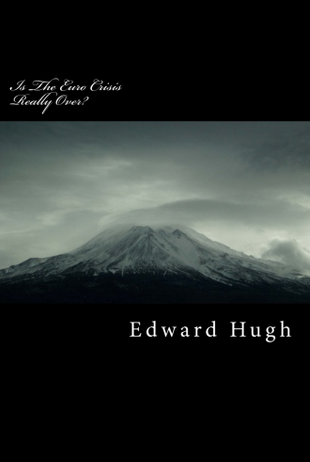 There is nothing in and of itself either deeply significant or earth shattering about this, it is possibly even a blip, although the most likely cause is the impact of the first quarter slowdown in the United States. It does however raise the rather interesting question of just what will happen to growth in the German economy as and when there is a slowdown in the rate of increase in global trade, if this means that German exports will be unable to maintain their recent blistering pace of expansion. This post will treat certain "stylised facts" about Eurozone imbalances (and here) and the relationship of these to the global economic imbalances situation as by now reasonably well established , at least for the purposes of this weblog. The first of these the "stylised facts" relates to the current debate over the so-called decoupling thesis, about which Claus Vistesen had an excellent recent post. This thesis generally asserts that the current wave of global growth is virtually unprecedented in modern times,and that the structural drivers of this growth - which is characterised by very strong rates of growth in some emerging markets (and in particular in the eurozone context in the new East European EU accession countries) - are new, and fundamentally different from those which characterised global growth in the 1990s. Another "stylised fact" is that large parts of the global economy are still extremely export-dependent on growth in consumer demand in the United States, although the fact that growth globally is running at some 5% per annum while most of the economies in the developed world are growing at under 3% per annum also means that this level of dependence is now in secular decline. This latter point logically leads to the conclusion that growth in the developing world is providing a momentum to this upswing which is what marks the whole process as a novel one. A third "stylised fact" would be that a number of countries are now revealing themselves as having export-dependent economies. This group can basically be broken down into two components, China and the oil producing states on the one hand, and the growing list of countries (Japan, Germany, Italy, Finland, Austria..) whose median ages are rising steadily upwards over the 40 year mark (and onwards in some cases towards the mid forties) due to the ongoing process of population ageing largely caused by a widespread and generalised demographic transition. Here in this post we are primarily concerned with trying to better understand what is happening in this latter group of "elderly" economies, and Germany will be treated as one very good example of these. That these "elderly" countries should show themselves to be increasingly dependent on exports should be neither surprising in terms of conventional economic theory - in this case Franco Modigliani's Life Cycle Hypothesis of movements in consumption and saving through the age ranges as applied to populations - nor in terms of the "known facts", since the idea of rising median age being associated with export dependence is now finding increasing empirical support in the anticipated countries (Germany and Japan in particular), where a characteristic pathology of congenitally weak internal demand, comparatively high (even if now declining) saving, and consequent strong dependence on exports to obtain GDP growth seems to be the order of the day. (More argumentation on the median age issue can be found in this post, while Claus ably argues out the implications of all of this for Germany here and here). So it could be argued that we have both theoretical justification and growing empirical evidence for advancing an "ageing structural characteristics" hypothesis, and I would say we have good grounds for asserting this hypothesis, although doubtless all of this needs more elaboration and validation as more countries age. But even as we move forward to try and do just that it is probably worth trying to go one step further, and examine some of the implications of this structural dependence for the future growth possibilities of the economies concerned. Are they still able, as some would claim, to generate self-sustaining economic recoveries? Or are they from-now-on-and-henceforth condemned to ever ride the coat-tails of global growth and demand which is generated elsewhere. Much as Claus and I may have been surprised by the resilience shown by the German economy, and indeed by the strong current growth we are seeing across the eurozone as a whole, which as Claus has argued tends to be significantly dependent on Germany, a form of "coupling" which in some ways mirrors the global one in connection with the US, but which involves the very significant difference that while those who are directly coupled to the US economy are in some form or another dependent on the US consumer, those who are indirectly coupled through the mechanisms of the EU - I am thinking here in particular of the eastern accession countries - or through the zone itself are in fact coupled to Germany and thus coupled to Germany's ability to sell exports to consumers both inside the EU and elsewhere. In Many cases, as we shall see, this generates a strong circularity in eurozone growth, since those in this chain who are also among Germany's major customers (often buying investment goods via cheap euro-denominated credit made available thanks to Germany's high savings rate, or thanks to a highly leveraged carry trade -in Swiss Francs or Japanese Yen - intermediated via the Austrian banking system), are thus sensitive to the strategic importance of the US consumer for the German economy due to their need to export back final product to Germany and other EU destinations, even though the US consumer obviously does not form part of the EU "inner circle". Turning to the most recent data published by the German Federal Statistical Office we can see that in fact taking into account calendar and seasonal adjustments, German exports in April increased by 0.9% over March 2007. So to some extent the drop in exports in March may be thought of as a blip. Yet if we look at the entire time series for from January 2006 (see Chart below, and please click on image to read) we can see that exports increased very rapidly in the first months of 2006, then the rate of increase slowed a little, there was another burst of activity in September and October, and since that time the rate of increase has been steadily dropping (the far right column showing the adjusted figures month-on-month is perhaps the clearest). In order to investigate further the real nature and dynamics of this export-driven growth phenomenon in Germany it is perhaps worthwhile putting the recent evolution of the German exports in some sort of context. Fortunately we are aided in this by the publication of a recent IMF working paper: What Explains Germany’s Rebounding Export Market Share? by Stephan Danninger and Fred Joutz. 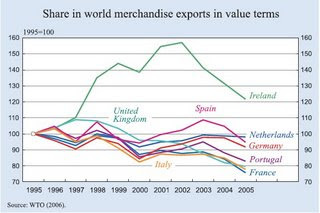 Germany’s export market share increased since 2000, while most industrial countries experienced declines. 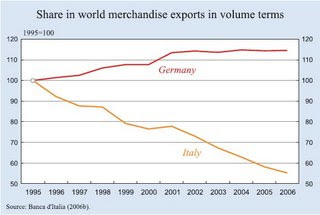 Now this statement does perhaps need a little clarification, since while it is true that the German market share in exports has increased in volume terms (as shown in the first of the following charts which compares the German performance with the Italian one), in value terms the German share has been declining slightly of late (as shown in the second chart). Nonetheless the German performance is still remarkable given the resilience of German exports even in value terms in the context of a global trade environment where growth has been very rapid indeed, and where several new contenders have made a dramatic entrance on the scene. Germany’s export sector has become its main source of economic growth. Since 1999 about 80 percent of real GDP growth was generated from net exports (see the first chart below). Real exports have grown by more than 7 percent per annum since 2000 on the back of growing trade volumes with both traditional European partners and emerging economies. 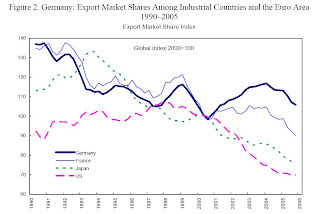 Since 2000 Germany has also begun to regain export market share, especially among industrial countries and the euro area (see second chart below, which is in volume terms). iv) regionalized production patterns through off-shoring of production to lower cost countries, partly a result of European economic integration (Sinn 2006). 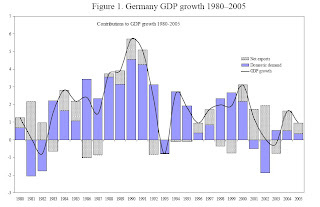 The authors then go on to assess the relative importance of each of these four hypotheses, and examine how their findings influence the prospects for continued German export growth and German economic activity in general. This focus is especially important since, as they note, export growth has been strong despite generally weak domestic demand and low consumption growth. Their analysis in fact shows that recent export growth can be traced back to the ability of German exporters to meet global demand and to exploit new production and cost-cutting opportunities from offshoring activities. Their analysis also provides some empirical support for the claim that German exports increased as a result of a regional division of labor in the production of goods (the bazaar economy hypothesis, most notably associated with Hans Werner Sinn). They find that the first two factors (ie the ability of German exporters to increase output and offer products that fit in with the recent surge in global demand and their ability to exploit new production and cost cutting opportunities from offshoring activities) are able to explain about 60 percent of the faster increase of German exports since 2000 vis-a-vis the other industrial countries. Changes in relative prices, measured by the real effective exchange rate, on the other hand, seem to have contributed surprisingly little to export growth despite a prolonged period of wage moderation. 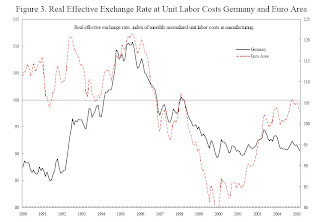 I say surprisingly, since this downward movement in relative unit labour costs has often been mentioned as an explanatory variable of some importance in the recent revival of economic activity in Germany. 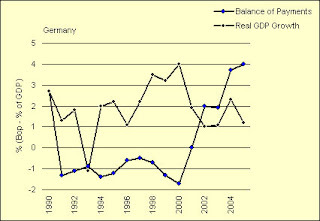 As the above charts indicate German unification resulted in a steep increase in wage costs, mainly from pressures to close the wage gap between the new and the old Länder, and from tax increases to cover the cost of extending the welfare state. The resulting loss of cost competitiveness and economic restructuring led to a sustained period of high unemployment. By the late 90s a period of extended wage restraint followed and to a large extent the position was reversed. Since the late 90s wages and salary growth in Germany has lagged behind productivity growth — the cost-neutral margin — in almost every year. Wage costs per unit of output began to decrease sharply in 1995 and have remained at a low level since 2000 despite a significant nominal effective appreciation of the euro. The main factor responsible for this adjustment has been muted wage growth in industry. Average hourly nominal wage growth has declined continuously and has been hovering since 2003 at somewhere around 1-2 % per annum rate. 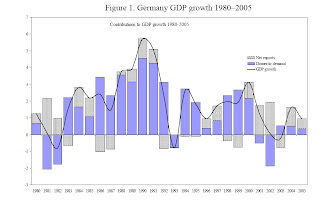 This has lead many observers to conclude that cost competitiveness has been a leading promoter of German export growth, and some have even argued that a return to more normal wage growth is now becoming possible, and that if this were to be realised it would help strengthen the ever-weak German domestic demand position (the so-called Goldilocks recovery hypothesis). However the IMF authors find that improved internal wage cost competitiveness has played a comparatively minor role in explaining Germany's brisk export growth. They find that Germany's prolonged effort in containing costs through wage moderation has been significant, but this effect has in turn been diluted by the appreciation of the euro. Hence cost competitiveness may be considered to have improved Germany's position vis-à-vis the euro area countries - and consequently it does help explain the significant rise of Germany’s export market share within the eurozone - but this factor does not in and of itself serve to explain the export performance with non-eurozone economies. Now if we look at recent data from the Federal Statistical Office we will find (as shown in the chart below) that despite the recent concerns over at the ECB about wage induced inflation, the actual movement in gross wages and salaries in Germany has been extremely weak both in 2006 and to date in 2007, despite the apparently favourable growth environment, and so far, for example, there is no real evidence of the "pass through" of the 3% VAT increase. Indeed in the first quarter of 2007 the costs of an hour worked in industry and services as a whole rose by only a calendar-adjusted 0.4% when compared with the same quarter a year earlier. Also upon adjustment for seasonal and calendar effects, labour costs per hour worked remained nearly unchanged (–0.1%) in the first quarter of 2007 against the previous quarter.This is significantly below the rate of inflation, thus it could be said that deflation in real German wages continues, despite a generally tighter labour market. The comparison with the UK and France here is most interesting, and it can be seen that the upward movement in German nominal wages is far lower than in these two major European economies. So the question is really why is this happening? "multinational firms in Austria and Germany are outsourcing the most skill intensive activities to Eastern Europe taking advantage of cheap abundant skilled labor in Eastern Europe. We find that the firms’ outsourcing activities to Eastern Europe are a response to a human capital scarcity in Austria and Germany which has become particularly severe in the 1990s." Now this finding when I discovered it really rather surprised me, although perhaps, with hindsight it shouldn't have. I had imagined, like many others doubtless also do, that Germany and Austria were outsourcing primarily unskilled, or lower skilled work (this is, for example, the situation in Sweden, see the Becker et al paper referenced below). But then reflecting a little on simple economic theory, and taking on board the fact that both Austria and Germany are now suffering relative shortages of young people, and the huge differential in skilled wages which exist between East and West , then it may well make sound economic sense for German and Austrian companies to employ relatively more intensive quantities (in terms of labour-capital ratios) of relatively cheap skilled labour in the East, and this does seem to be what has been happening. Corporations’ outsourcing of skill intensive firm activity to Eastern Europe has helped to ease the human capital crisis in both countries. We find that high skilled jobs transferred to Eastern Europe account for 10 percent of Germany’s and 48 percent of Austria’s supply of university graduates in the 1990s. The Austrian number seems really enormous, the German one less so, but it is still important. In addition Marin produces data which shows that German affiliates in the accession countries were paying (prior to 2004) 17 percent of their German parent wages but were increasing their productivity to 60 percent of the parents’ productivity level. Simple mathematics therefore suggest that they were able to reduce the labor costs by 72 percent relative to their parent-firm cost in Germany. 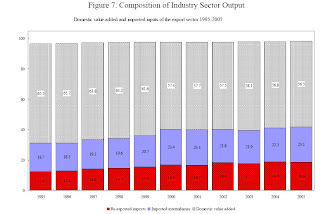 On examining the pattern of multinational investment and outsourcing across sectors Marin found that German investment was predominantly engaged in manufacturing activity in Eastern Europe (almost 60 percent of total investment), of which manufactured goods and machinery and transport are the most important sectors. She also found that some 90 percent of German investment in machinery and transport were outsourcing (rather than local market oriented) investments. b) the share of personnel engaged in R&D or engineering activities in the manufacturing and service sector. The data she studied suggest that the high-skill ratios of affiliates (the number of university or college workers in percent of total affiliate workers) are 2 to 3 times as large as that of German parent firms in the Eastern Accession Countries. The share of university or college graduates among affiliate workers in Eastern Europe was found to vary between a high of 86 percent (Czech Republic) and low of 8 percent (Slovenia). The most skill intensive activity was being undertaken by affiliates in the Czech Republic (with a skill share of 86 percent), and Slovakia (skill share of 40 percent). This compares with an average share of university or college graduates of German parent firms of 18 percent only. Thus, measured by the number of university and college graduates, German affiliates in Bulgaria were found to be 12 times as skill intensive than their German parent firms, and affiliates in the Czech Republic 5.5 times as skill intensive. Only affiliates in Hungary were found to have a skill share below that of German parent firms. A similar picture emerged when she looked at the skill intensity of German affiliates as measured by the share of workers engaged in R&D and engineering. The R&D personnel ratios of affiliates in Eastern Europe ranged between 4.0 percent (Slovakia) and 27.8 percent (Croatia and Russia). This compared with an average R&D personnel share of 13.6 percent of German parent firms. Thus, German affiliates in the Czech Republic are 1.7 times as R&D intensive as their German parent firms. Economic theory guides us to look at the factor endowment of these countries for an answer. If countries outsource the most skill intensive activities to other countries, then these countries must be poorly endowed with skills relative to their trading partners.When Germany and Austria’s endowment with skills is compared to Eastern Europe.....we find.....the Baltic States, Russia, Hungary, and Bulgaria are the most skill rich countries as measured by the share of the labor force with a tertiary education level. Germany’s education level lies below the OECD average and roughly matches that of the accession countries average. In particular, Germany is less skill rich than the Baltic States, Russia, and Hungary.In this ranking of countries Austria turns out to be the most skill poor country. Maquiladoras are affiliates of US multinationals in Mexico which specialize in the low skill intensive part of the value chain. Sruggling with the phenomena she found before her, Dalia Marin was lead to ask whether it might in fact not be the case that with the Eastern Enlargement process an inverse Maquiladoras effect was emerging in Germany, since German multinationals are evidently outsourcing to some extent the more skill intensive stages of production to Eastern Europe and retaining the more labor intensive stages of production in Germany. As a result, the relative demand for skilled labor declines in Germany and in this way, outsourcing of high skill intensive activities to Eastern Europe has helps to ease the (partly demographically driven) human capital crisis in Germany. 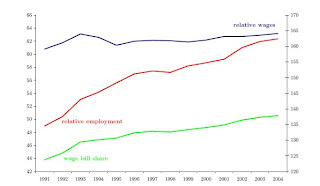 So this may in fact offer us some part of the explanation as to why relative wage for skills in Germany (or skill-bias in wages) has not increased on the back of the information technology revolution of the 1990s since outsourcing activities have removed some of the demand pressure on skills from the German labor market. It may also help to offer some part of the explanation for why hourly wages on aggregate are not rising faster inside Germany itself. Now the above graph illustrates movements in the skill premium and the German labour market over the last 15 years or so. Essentially it shows the ratio of high-skilled to low-skilled wages and employment and the high skilled workers wage bill share in German manufacturing. What can be seen is that over the period from 1990 to 2004 the wages of high-skilled workers remain fairly constant relative to those of low-skilled workers. The right hand axis charts the evolution of the skill premium. What can be seen is that, following a slight peak in 1993, followed by a decline until 1995, there was a slow and steady increase from 1995 to 2004, from an index reading of 160 to 164, but that all in all these changes remain marginal. But when we come to look at employment, the employment of more highly skilled (or non-direct-production) workers increased by 27% over this period, moving from being 48% of the total workforce in 1991 to 64% in 2004. So the real question is: how - given the relative shortages of new skilled labour inside Germany - has this subtantial increase in the skilled labour employment share been possible with such a slight change in the skill wage premium. I think the arguments Delia Marin offers may well provide us with some significant part of the answer. Now aside from the interesting explanation insight that all this may offer into the dynamics of the German labour market, I would also like to add that the process Marin identifies represents decidedly bad news for those economies which face labour shortages and ageing workforces. Let me explain why. Essentially it has been argued - and standard neo-classical theory indeed anticipates - that tightening in ageing labour markets should lead to rising wages and relative capital deepening (as capital gets substituted for ever more expensive and scarce labour). Now this has always been thought to imply that the society which is subjected to this process would move up the value chain under such pressure, and as such domestic value-added and productivity would increase in a way that meant that living standards (and hence health and pensions systems) could be maintained. 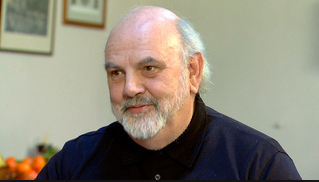 Now, if Marin's work proves to be backed by further research findings, I would say we might be seeing the beginnings of another possibility here, one where labour market tightening in some countries leads to skill outsourcing, and to an increase in the relative proportion of non-skilled activity in the ageing home country. b) increasing dependence on export driven growth due to weak growth in domestic demand. This latter point (b) is important since it is the absence of strong growth in domestic demand (most noticeably typified by the absence of housing driven growth) which creates a deficit in certain sectors of knowledge economy services employment which have to be compensated for by dependence on export markets, and a strong tendency towards certain types of outsourcing. In comparison - for example - the US economy has seen a significant drift in outsourcing employment, but the labour market for skilled young workers has remained strong due to growth in the domestic services sector, and indeed the US is a net importer of skilled labour. Since similar processes MAY also be at work in Japan and Italy, this would seem to be a line of enquiry which is well worth checking out to see if the German (and to some extent Austrian) impacts are replicated. Well, the financial markets are happy at any rate. The Turkish stock market jumped 5% on Monday while the lira closed at a two-year high against the US dollar. Tayyip Erdogan (leader of the victorious Justice and Development party, the AKP) was also a happy man: “The new government will bring peace and stability" he informed us. I guess we had all better hope he is right. Indeed there are plenty of reasons for satisfaction with the outcome of Sunday's elections in Turkey, and despite the very large number of outstanding problems still to be addressed, things could, at the end of the day, have turned out far, far worse. However, given the complex and tangled web of relations which surround Turkey's political life right now, there are also reasons, and plenty of them, for being at least a little nervous. Before getting down to the nitty gritty, it is worth noting that in general general press and internet coverage of the Turkish election has been quite systematic and fairly informative. Manuel Alvarez of Election Resources has a summary of the results here, and a background briefing here. Among the many articles that caught my eye M K Bhadrakumar had a very insightful piece in the Asia Times over the weekend, with the rather provocative title of Turkey's Election has no losers (I will return to this below) , Bloomberg in the days before the election was full of information about how Tayyip Erdogan was busy flooding rural Anatolia - the AKP's heartland - with water and public money. Back in June the Financial Times had a useful background article on the city of Sivas, onetime stronghold of the main opposition Republican People’s party (CHP). The most immediate challenge facing Prime Minister Recep Tayyip Erdogan is clearly the need to settle the choice of a new state president. After all, it was the Turkish Parliament's earlier rejection of Erdogan's candidate, Foreign Minister Abdullah Gul, which precipitated the elections in the first place. Supporters of the secularist opposition party CHP distrusts Gul, a practicing Muslim whose wife attracts a lot of attention due to the fact that she wears a head scarf in public. For supporters of the CHP - and in increased measure for supporters of the right wing Nationalist Action Party (MHP) - this is seen as a symbol of Islamic militancy. If Erdogan were simply to resubmit Gul's name this could well lead to a new deadlock, as the AKP lacks the two-thirds majority needed to push the nomination through, and even if they did have the necessary majority, any move to impose a president without some sort of consensus with the CHP would be pretty divisive. However, there have been signs that the AKP leadership, fresh from the electoral triumph is eager to avoid yet another confrontation. "God willing, we will end the presidential election process without giving rise to any tensions,'' Prime Minister Recep Tayyip Erdogan was reported as saying after leaving his meeting on Monday with Turkey's current president, Ahmet Necdet Sezer. Which brings us more or less directly to the second challenge facing the new Turkish governmernt, the need to continue the process of legal and administrative reform which will equip Turkey for European Union membership. Noises coming out of Brussels this week have already signaled the desire there that Ankara regain the lost momentum associated with Turkey's accession process. EU Enlargement Commissioner Olli Rehn is widely quoted as saying that he expects a new Turkish government to be formed quickly and that "It is essential that the new government will relaunch the legal and economic reforms with full determination and concrete results". In fact the EU froze talks with Turkey last December on eight of the 35 policy chapters which form the basis of the accession process, largely because of Ankara's reluctance to open ports and airspace to Cypriot ships and planes. It is to be hoped that the Cyprus situation is one which the new government in Turkey will now feel freer to address more directly and more constructively. In fact both Brussels and Ankara have been busy trying to keep talks going on a largely formal and technical level in the meantime (by negotiating on the four chapters which have already been opened). One point of interest in the statements being made by Commissioner Rehn is the way they reveal the complex web of issues we are all involved in here, since he explicitly expressed the hope that Turkey will make "concrete progress" on freedom of expression and religion. Now this may be seen as being a reference to a whole battery of questions (to the Pamuk case for example, or to the case of politicians in Western Turkey who face legal threats for the mere fact that they argue for a new federal structure) but it could be read as saying that the EU, in a country where the majority of the population are of the muslim faith, would find nothing strange about the wife of a President wearing a headscarfe, indeed this could be thought to be only normal and proper in the same way as the pretender to becoming British head of state might be at one and the same time divorced and nominal head of the Church of England. In other words religious freedom can mean a lot of things, although this reality is likely to do little to mollify many of the supporters of the CHP. So what we would seem to have here are the seeds of what essentially is quite a fragile dialogue, where in fact the two parties at the end of the day actually need each other. On the one hand the EU needs Turkey, in the sense that our idea of religious tolerance should expand to include the idea that there is nothing wrong, or out of order, with the wife of the President of a member state wearing a muslim headscarfe, and the AKP need support from within the EU in order to "anchor expectations" among those who come from the secular tradition that the reform process as it is evolving in Turkey is not set straight down the road towards the creation of an Islamic Republic. The third major challenge facing the new Erdogan government is, of course, the Kurdish question, and the delicate relations with the new autonomous region in the North of Iraq. Even here there are some promising signs. For the first time in many years, the new parliament will include deputies with explicitly Kurdish affiliations. These politicians will have the rather onerous task of persuading the rest of Turkey that the Kurdish conflict can be settled by dialogue and negotiation.Obviously the whole situation is complicated by the emergence of the autonomous Kurdish region in northern Iraq, which many Turks fear may spur increasing Turkish Kurdish demands for eventual independence. Turkish troops are currently massed along the Iraqi border, in preparation for a possible incursion in pursuit of guerrillas based there. But Tayyip Erdogan is unlikely to bend to the military here - in particular since he takes the view that that the Turkish military has already made 29 incursions into Iraqi territory since the 1990s, without dislodging the guerrillas - and is far more likely to use his sweeping election victory to open a dialogue with the Kurdish insurgents. Part of the reasoning behind this assessment lies in the little detail that the AKP scored a remarkable victory in the Kurdish south-east itself, doubling their support in these largely Kurdish areas, and obtaining an absolute majority of the vote there (52%). The main Kurdish party inside Turkey, the DTP, took 23 seats, putting it in the new parliament for the first time since 1994. The first indications are not discouraging. According to the Toronto Star, a "jubilant" Aysel Tugluk, one of the 23 Kurdish politicians who won parliamentary seats, declared from the Kurdish city of Diyarbakir that "We want to turn a new page...We want to start a process of dialogue and reconciliation in parliament to resolve the (Kurdish) problem......We will not be a source of tension ... We will act in a spirit of tolerance and understanding." Problems and possibilities abound. On the one hand, given the fact the AKP lacks the desired two thirds majority, the DTP deputies could offer an interesting point of support (shades of the Spanish PSOE, and its recent alliance with the "separaratist" Esquerra Republicana de Catalunya - ERC - here). But any such "alliance" would be fraught with danger, since the DTP is not the Catalan pacifist ERC, but far more akin to the outlawed Basque Batasuna, insofar as the DTP is widely considered to be the political wing of the PKK. However, the long term stability and prosperity of the Turkish state passes down the road of resolving once and for all the "Kurdish issue", and Erdogan well knows this. So we should expect to see some sort of tightrope balancing act emerging, and again the EU can well play an active and constructive role here. This is where outsiders run into a problem in appreciating the range of the Turkish military's political agenda. It is very simplistic to view the military's opposition to the AKP as the manifestation of a straightforward struggle between the forces of secularism and Islamism. The military's political agenda is multi-layered. It is so apparent that "terror" replaced "secularism" as the hot-button issue for the Turkish military, even as the election campaign got under way in recent weeks. That's because the military saw that the only way the AKP could be stopped in its tracks, despite its impressive record of reform and economic growth, would be by making Erdogan appear to be "weak on terror". The Jerusalem Post commented, "Threatening to attack the PKK [Kurdish Workers' Party] in northern Iraq has [proved] a powerful propaganda tool for the Turkish military ... the military has pushed security concerns to the forefront in order to reinforce an image of the AKP as indecisive and soft on terrorism and to benefit the nationalist and secular parties with which they have close ties." The military's muscular intervention in the political scene in the past few weeks actually generated electoral support for the ultra-conservative MHP. There is no question that the military has a huge stake in the outcome of this election, for political, ideological, and even commercial reasons. Its huge economic interests, from automotive to insurance, held through the armed forces pension funds, are a pillar of the secular business establishment. 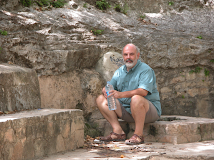 In many ways, it seems to me that Turkey is more like Mexico, which underwent a revolution around the same time as Turkey, featuring - like Turkey's - a strong secularist (or if you will, anti-religious) component, although in both countries there is a large underclass that has remained fairly religious, official policies notwithstanding. In that regard, Erdogan's AKP is not entirely unlike Mexico's National Action Party (PAN) - which regards itself as a Christian Democratic party. To be certain, there are major differences: Mexico's PRI remained in office for half a century after CHP was voted out of power in Turkey, the Mexican armed forces have played no role in the political process for a long time, there's no major far-right party, and the Mexican government came to terms with the Roman Catholic Church in the last years of PRI rule (an event made possible by the transformation of the Church in the years following the Second Vatican Council, which contributed to defuse the old Church-state conflict in Spain as well). So, in conclusion, are there grounds for optimism? I think so, and many of these are economic ones. The Turkish economy has been booming in recent years. In the past five years, growth in gross domestic product has exceeded 7% annually, and exports more than tripled to over $95 billion for the year ended June 30. Despite the recent "correction blip" last summer, Turkey would appear to have remained on course, and Morgan Stanley's Sehan Cevik is even arguing that Turkey has the potential to become a trillion dollar economy in the next ten years. Against this background the AKP would seem to have the cards well stacked in their favour, and the old corporatist elements in the Military and the CHP would appear to lack any significant external support, either strategically or financially. Stronger growth hasn't however substantially reduced Turkey's unemployment rate. Unemployment has remained stubbornly high, and is currently running at about 10% according to the Turkish Statistical Institute. And in the cities, where hundreds of thousands of rural workers flock each year in search of jobs, unemployment was at 12.6% in 2006. So far the voters have stayed with the AKP, but this patience will reach a limit, and in this sense doing something to substantially raise the living standards of its electoral base will become an important priority of the AKP in the coming years, and it is this need which can constitute a powerful leverage instrument for those who know how to use it. Among these we are unlikely, it seems, to find M. Nicholas Sarkozy, who interestingly enough would seem to share far more with the thinking of the trounced CHP than ever he does with the so-called neo-liberal AKP. Sarkozy has put the whole Turkish entry process into question, and has most notably been widely quoted as saying that Turkey has "no place" in Europe. So was the defeat for the CHP also the first substantial defeat for Sarkozy as French President? Well lets certainly hope so. Clearly there are indications from the statements of people like Rehn that calmer heads will prevail, and it is not without interest that Portugal, who holds the current EU presidency has been a staunch supporter of Turkey's EU ambitions, and has expressly stated the aim of moving ahead with negotiations during their coming six-month term. Could we be seeing more than one party onto a sound thrashing here? Definitely one to watch. In a recent Afoe post on European Fertility (which was really an extended review of an article in the Economist) I took some considerable stick in comments for being too soft on the journalists over at the Economist who were behind the article (mainly because a large chunk of the "good news" they claimed to have found was, when all is said and done, spin, as Ape Man ably explains in this most moderate of rants from a lifelong Economist subscriber). This post should produce no such complaints. My issues today relate to an article The Economist currently have on site entitled "Eastern Europe's economies, Worrying about a crash". In fact, the article is, in the main, about Latvia, a small country which is currently suffering from a very acute form of labour-shortage-induced wage-price spiral, with wages having risen in the first quarter of this year by around 33%, while property prices in Riga - the capital - had gone up last May by something over 60% when compared with a year earlier. (Regular readers will already know that Latvia had already been attracting my own attention somewhat, and those who want a day by day commentary on the unwinding of Latvia's property boom may find it interesting to follow events from the vantage point provided by Latvian Abroad. Now,as I say, Latvia is, at the end of the day, rather a small country (with only a little over two million inhabitants) so why all the fuss? Well in the first place the problems being experienced in Latvia seem to be rather more general than might appear at first sight. The Financial Times only last Thursday had an article drawing attention to how the same sort of issues, to greater or lesser extent, were affecting all three Baltic states, and the credit ratings agency Standard and Poor's only last week downgraded Estonia's rating from stable to negative citing the growing risk of a hard landing even there. I say "even" since, at least on the surface, Estonia would seem to be the best placed of the three of them. It is also important to note that what is happening in the Baltics takes on even greater significance when situated in the context of a general labour supply problem which, in the shorter or longer term, is about to face all Central and East European "transition" societies, whether they be inside or outside the EU. Hence the importance of comparisons, which, as we shall see, the Economist itself is only too ready to engage in. 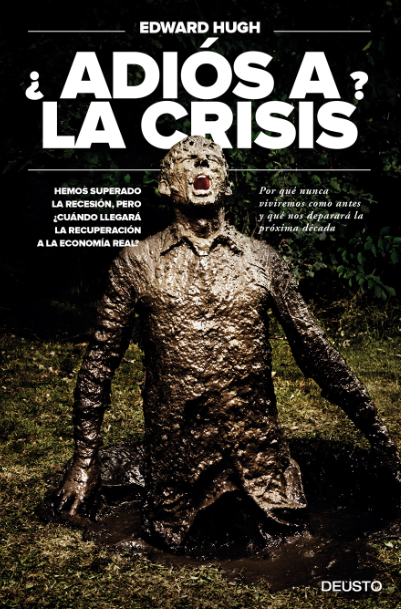 Since, however, my theme today is the quality of economics journalism, and the responsibility that those of us who write about economics have for trying to get things right, I will only frontally address this topic here, leaving treatment in depth of the underlying problems being posed in the Baltics for a subsequent post. My issues with the Economist are threefold. Firstly, when they come to examine the fragility of the current economic growth cycle in Eastern Europe the Economist writers argue that Hungary, despite being a "wobbly" candidate for contagion if things go badly wrong in the Baltics, is in fact likely to escape the worst case scenario of a hard landing as its current economic imbalances unwind, since Hungary has, in general, been "disgustingly lucky", and the best example they have to hand of this "disgusting luck" would seem to be the fact that "exports and industrial production have risen". Now, in fact, while it is the case that Hungarian exports have been rising more quickly than imports in recent months (although please note that this is due in part to a slowdown in domestic demand), industrial output has in fact fallen in 3 of the last 4 months. I sincerely hope that Hungary will avoid a dramatic crash, but if you want to argue that they will, and back this with analysis, then first and foremost you need to get your facts right. "For countries that can do it, keeping their interest rates above the euro's and letting their currencies appreciate helps" and "bringing in foreign workers from places such as Ukraine" may help "reduce upward wage pressures. Slovakia is a prime example of how to pull off both tricks". "Slovakia could soon become the world's biggest car producer per capita - if it can find enough skilled workers to assemble the vehicles ".... but .... "Now, having carved out a niche in car manufacturing in recent years, Slovakia is suffering from the same regional labor shortage that is exacerbating concerns that foreign investment could be deterred". The source for the IHT article was a report published last week by the Vienna Institute for International Economic Studies, which you can find here, and in fairness to our Economist authors the report does say that in Slovakia, as opposed to the Baltics or Romania or Bulgaria, the overheating problem may be containable in the short term and even that "very high growth does seem to be sustainable, at least over the next two years". But then two years at the end of the day do not exactly constitute what you would call a long term outlook for sustainability, so what is it we are saying here, "go down the Slovakian road and you can enjoy life for two more years before you then finally get to crash"? Yet another time we have here a case of get your facts straight before preaching, I think. "changes in population are not - in and of themselves - either a good or a bad thing in economic terms, since “there is no short-term correlation between population change and wealth"
In fact, what is happening now in Eastern and Central Europe may finally provide the Economist with just the sort of evidence they feel has so long been lacking. Basically the situation is this: years of systematic out-migration and a collapse in fertility around 1990 have left all these countries with a significant and ongoing labour supply problem. Claus Vistesen has just done some very interesting background research for Lithuania which really help put things in perspective (and especially the easy-to-read graphs, which are an absolute must). Using back-of-the-envelope-type calculations, if we consider that Lithuania currently has around 50,000 unemployed, and economic growth is reducing this pool by about 5,000 a month, then you don't need to be a mathematical genius to work out that they have about ten moths left before they run out completely, and this is clearly impossible. So push does come to shove, one way or another, within a time horizon of about ten months. But why am I niggling like this with the Economist? Because behind all this lies a much bigger debate, one about the sources of economic growth, and about the relative size of the demographic and the institutional components in growth. The journalists at the Economist clearly have an in-house view that the demographic component is not important, and this has lead them in one country after another across the globe to either simply ignore the issue, or to say that the importance of demographics is greatly overstated. In Japan, for example, they continue to believe in a sustainable, internal-demand-driven, recovery (despite the fact that as Claus Vistesen explains here), the recent data we have from Japan do not support this assumption at all). In India (which has as we all know, lots and lots of young people just about to enter the labour market) they continue to argue the absurd view that the Indian economy is in grave danger of overheating (a view which Nanubhai Desai systematically refutes in this excellent post here). Meantime, and as is only to be expected in any economy which is running short of natural coolant, overheating is visibly starting to show its face all over Eastern and Central Europe. So what was up to now a reasonably academic debate is about to become a live macro issue, and my strong chiding against The Economist is simply due to the fact that in turning a blind eye to one possible account of the growth process they will have done nothing of any great substance to inform and forewarn their readers of what may now be about to come. As he wearily raises his telescope over the dust-ridden patch he declares "people, I see no people". Yes, that is just the point. Well just in case any of you have the impression that the points raised here simply constitute some kind of oversight on the part of the Economist, the Economist Intelligence Unit have dispelled any remaining doubts we may have entertained. They have just published a new study entitled Eastern Europe: booming economies, dangerous politics, which astoundingly - at least going by the blurb - doesn't seem to treat the labour supply constraint question as having any importance at all. At this point I haven't read the whole report, I admit, but then, is it really credible for people to ask would-be clients to shell out £335 for something which seems to miss the central point about what is going on? The quality of our current intelligence is indeed, it appears, severely strained. Also doing some background digging on Slovakia, I found this data in the Slovak Spectator. Slovakia has a pool of about 200,000 unemployed, and is eating into it at a rate of about 50,000 a year, which gives an outer limit of about 4 years, at current growth rates. But then of course there are skill bottlenecks, and demands on the Slovak labour pool from other countries to think about. So in reality the situation is much tighter than it seems, especially in Bratislava. Slovakia's currency - the Slovak Koruna - does however continue to appreciate, since industrial output has just risen year on year by 17.9%, but the steady increase in the value of the currency may in today's climate, have the rather perverse effect of boosting domestic demand even more by attracting an inward flow of funds in the anticipation of even more currency appreciation, in the process fuelling the Bratislava housing boom mentioned in the above link (which of course means an increased need for construction workers, and on and on we go, of course, until the day we don't).